A radiographic record of contrast esophagography or barium swallow. 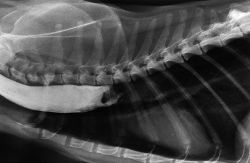 A radiograph of the esophagus. a contrast radiograph of the esophagus. To confirm the diagnosis, CT ionic oral contrast esophagogram was done which clearly depicting a large diverticulum in upper prevertebral space through the posterior pharyngooesophageal wall and also the same in barium swallow (Fig. Diagnosis is based on the demonstration via barium esophagogram of a tract/fistula originating in the piriform sinus. Barium esophagogram was performed in 12 patients, and fiberoptic bronchoscopy was performed in 10 patients while cardiac catheterization was performed in one patient. Gastrograffin esophagogram showed patency without leak, five days after the procedure (Figure 1). Persistent, unrelenting symptoms may underscore the need for further tests that include an upper endoscopy test, esophagogram (x-ray of the esophagus and stomach), or 24-hour esophageal pH test. Persistent, unrelenting symptoms may underscore the need for tests that include an upper endoscopy test, esophagogram (x-ray of the esophagus and stomach), or 24-hour esophageal pH test. Rigid bronchoscopy or the prone lateral pull-back esophagogram offer more definitive evidence of H-type TOF. Furthermore, leakage may be delayed, so that an immediate esophagogram may fail to demonstrate extravasation. An esophagogram showed a normal mucosal profile, marked esophageal dilation (2 to 3 times normal size), a type I hiatal hernia (figure 1, A), poor motility, and spontaneous reflux and pooling of gastric contents into the patulous esophagus when the patient was lying prone (figure 1, B). Because of dysphagia, barium esophagogram was performed and neo-plasm located in the thoracic esophagus was detected.